Ben Shemen Forest is one of Israel’s best known and most popular cycling venues. Hundreds of enthusiasts throng the woodland every weekend to enjoy a variety of bike routes that allow cyclists at every level to engage in this marvelous pastime. The forest itself extends over a total area of some 21,000 dunam (approx 4,250 acres) on both sides of Route no. 443. Cyclists are in the habit of referring to the southern side as “Mitzmod” (short for Mitzpe Modiin) and to the northern as “Tel Hadid”, after the tel that soars to a height of 147 meters and dominates the entire area. KKL-JNF has constructed three cycling routes for mountain bikes within Ben Shemen Forest: the Herzl SingleTrack (indicated by blue trail markings), which is some 10.5 kilometers long and can be ridden by cyclists with only most basic skills; the Anava Single Track (marked in red), which is about 24 kilometers long with a cumulative elevation gain of 450 meters; and the Hadid Single Track (marked in green) on the northern side of the forest, beyond Route no. 443. The Herzl Single Track enables cyclists making their first tentative foray into mountain biking to ease into things gently and see for themselves what the sport entails. Because the route begins at a point where cyclists tend to congregate at weekends, it allows beginners to hook up with more skilled riders who will accompany them as they venture along the trail. This route is not hard physically, nor does it involve complex technical challenges; nonetheless it takes the cyclist for a fascinating run and gives him or her a taste of everything that Ben Shemen Forest has to offer. The Anava Single Track is designed for more experienced cyclists with at least a moderate level of skill, and its length and cumulative elevation gain demand greater physical and technical capabilities. 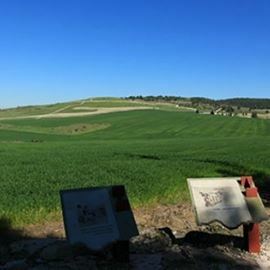 This route takes riders deep into the countryside as it crosses the forest and leads into the open areas to the east of the ancient Jewish settlement of Gimzo (now Moshav Gimzo) and the approach to the Hurvat Regev ruins, which provide a magnificent view of Israel’s Coastal Plain. Cyclists looking for a longer and more demanding route will combine these two single tracks (Herzl and Anava) to create a challenging but enjoyable 35-kilometer ride. The Hadid Single Track, in the northern part of the forest beyond Route 443, is the newest of the routes that KKL-JNF has built in the area, and it is characterized by a variety of challenging technical passages that make it suitable for cyclists with at least a moderate level of abilities. 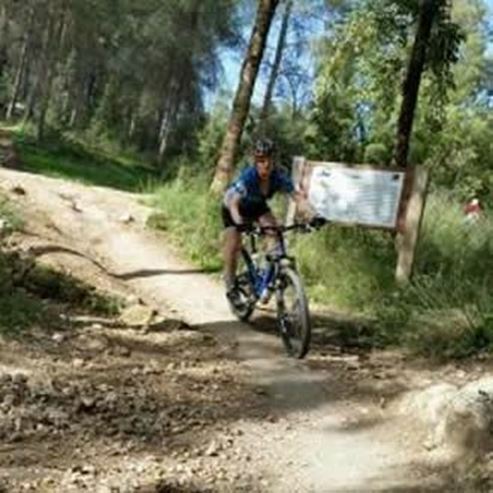 This route is around 11 kilometers in length, and many cyclists choose to combine it with the Herzl Single Track in order to enjoy the variety of experiences these two different areas of Ben Shemen Forest terrain have to offer.